Aloha! I step off the plane and am instantly met with that soft, balmy tropical breeze which is unique to Hawaii. The fragrance of the plumeria lei placed about my neck and the gracious aloha greeting instantly puts me in a Hawaiian state of mind. I am ready to lift my face to the golden Hawaiian sun, bury my toes in the sand and surrender to the ancient mysteries of the Big Island of Hawaii. The Big Island is so diverse and authentic. Travel the width and breadth of this largest of the Hawaiian islands and you will see black-as-ink lava tumbling dramatically to the sea, cowboy country where cattle graze adjacent to historic Hawaiian villages, exotic black sand beaches, awe-inspiring volcanoes, rockin’ towns, abundant rain forests, waterfalls, coffee plantations, botanical gardens, and gorgeous stretches of pearlescent beaches. This island has it all! 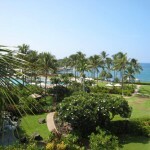 Our temporary Hawaiian home is the gracious Fairmont Orchid, located on the spectacular Kohala coast, which boasts some the most beautiful beaches in the world. The charm of this luxury resort lies in the fact that it is elegant without being pretentious. 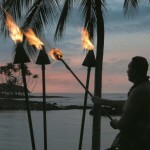 The legendary Hawaiian hospitality is evident everywhere, especially in the staff who are always eager to please. As we arrive, we are met with a breathtaking setting – sweeping views of the Pacific Ocean along with five mountains, including Mauna Kea, the world’s tallest mountain when measured from its base on the sea floor. Opulent teak wood floors, banisters and staircases and vintage Hawaiian chandeliers decorate the public rooms and corridors of the Fairmont. 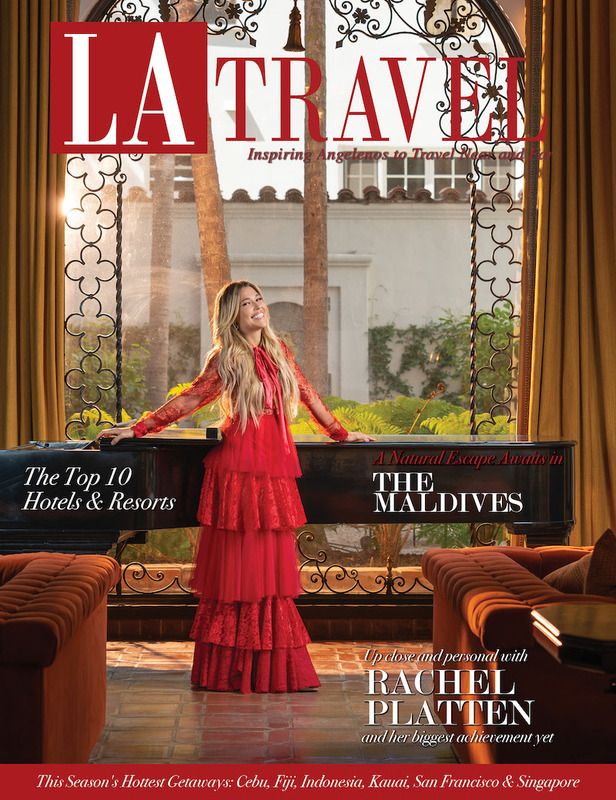 As we stroll through the gardens, we are delighted at the abundance of plumeria trees, yellow hibiscus, coconut palms, towering banana trees, blooming orchids and rushing waterfalls which grace the landscape. Our well appointed suite is spacious and modern, blending fresh white and ivory palettes with splashes of island-inspired colors of coral and moss. The teak furniture is rich and there is a private lanai which opens onto sensational views of the ocean and the lush gardens, plus a comfy sitting area with upholstered chaise furniture. 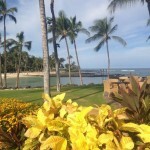 The Fairmont has a lovely pool and an even more stunning private beach and lagoon. You can choose to relax in your private cabana stocked with your favorite snacks and drinks, or enjoy a variety of water activities – snorkeling, paddle boarding, kayaking and outrigger canoeing! The lagoon is teeming with sea life and is a first rate place to snorkel. The minute you dive into the clear aquamarine water you’re treated to the sight of vibrant coral, colorful fish and best of all, a large family of Hawaiian sea turtles which make this lagoon their home. If you have ever dreamed of swimming with majestic green turtles like I have, this would be your chance! Its sunset and we have arrived for dinner at the Fairmont’s signature restaurant, Brown’s Beach House. This award winning establishment is consistently rated as a top place to dine on the Big Island, and with good reason. 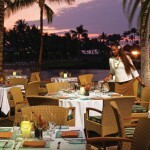 With its expansive ocean views, incomparable cuisine and sophisticated Aloha service, Brown’s sets itself apart as a truly unique dining experience. We are welcomed by a gracious staff upon arrival who seem genuinely pleased that we have joined them for dinner. Our table is beachfront and our view of the sunset is perfect. As the tiki torches are lit, we sink down into our seats and take in the natural Hawaiian ambiance. We might as well start things off right, so we order cocktails – a Fairmont Mai Tai and the drink that becomes my very favorite during our stay here – the Lilikoi (Passion Fruit) Margarita. I call the Lilikoi Margarita “vacation in a glass” – one sip and you know your vacation has really started! As the crimson sun gently sinks behind the horizon and silhouettes the palm trees, the stars begin to come out against the black Hawaiian night sky. 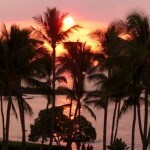 Soft Hawaiian melodies filter through the air as local entertainers take their place on the edge of the lanai. It is a dreamy setting and we settle in for what will be an evening to remember. Our server is friendly and takes the time to chat with us about all of the different offerings on the menu, which is decidedly “Big Island Cuisine” – Pacific Rim fused with innovative island-inspired/Hawaiian regional flavors. 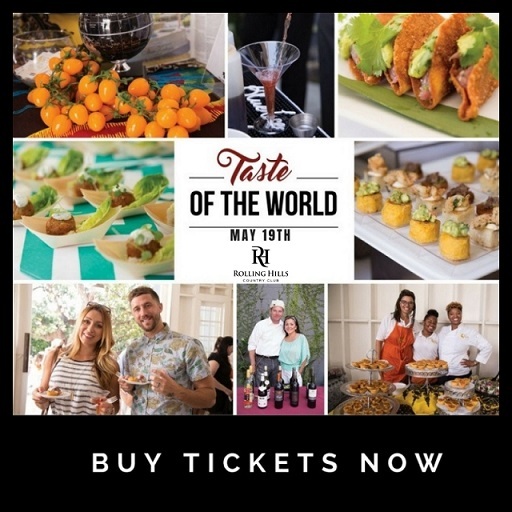 As I peruse the menu, I realize that choosing from all of these alluring dishes is going to be a challenge – but we are up for it! The entrees arrive at the table, elegantly presented and prepared to perfection – this food is beautiful to look at, and even more wonderful to taste! Our dinners are accompanied by some of the chef’s signature side orders – our favorites are the decadent Truffle Potato, Smoked Bacon Mac & Cheese, the Sautéed Waimea Sweet Corn and Grilled Asparagus with Lemon-Truffle Soy. Just when we think we cannot hold another bite, our waiter tempts us with the dessert menu. Brown’s is famous for their Mud Pie, so we have to try it, right? We are also persuaded to try their “Snicker Bar”, named for its resemblance to the popular candy bar but with a unique Hawaiian twist, which marries White Chocolate Mousse with Caramel and Macadamia Nuts. Both desserts are superb and we enjoy unashamedly! A tableside visit from Chef Darren Ogasawara is the perfect way to end our evening. It is an honor to meet him and he takes a few minutes to chat with us about the innovative menu which has made Brown’s famous. A big Mahalo to Chef Darren and his team at Brown’s Beach House for a truly magical evening! What do you do when you’ve had enough fun on the beach for awhile, but you’re too relaxed to do anything but lie around? You book a massage, of course! The Fairmont’s Spa Without Walls is the epitome of a unique pampering experience. True to its name, treatments are enjoyed outdoors. I have the choice of several locations for my massage – while the outdoor hale nestled among a secluded retreat of waterfalls, streams and koi ponds is inviting, I ultimately choose an oceanfront cabana. As I wait for my massage to begin, I relax in the low-slung teak lounges of the outdoor waiting room. Under the shade of succulent flora, the sound of fountains and waterfalls is my only music. I’m escorted through the gardens and down the path to the sea, where a shaded and very private cabana awaits. The afternoon light twinkles over the azure sea and a school of little flying fish are jumping right in front of me. As the massage begins, the gentle trade winds caress my skin and I surrender to the hypnotic touch of the “lomilomi” massage accompanied by the rhythmic sounds of the waves caressing the shore. Sigh. It is all so wonderful! In a refreshing way to finish off the perfect massage, instead of the traditional hot stones, icy cold stones are gently massaged across my temple. Heaven! One of the must-sees on the Big Island is the Hawaii Volcanoes National Park. Volcanoes created the entire Hawaiian island chain. To this day, Kilauea and Mauna Loa, two of the world’s most active volcanoes, are still adding land to the real estate of the Big Island. 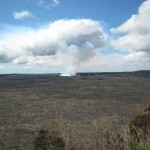 Kilauea, the most active volcano in the world, is undoubtedly the Big Island’s most famous site. A trip to the Volcanoes National Park from the Kohala area takes a full day, but it is so worth it! On our visit to the Volcano Park, we are absolutely fascinated. We are witnesses as the Kilauea Crater shows off with a larger than normal eruption, spewing large plumes of smoke and gas into the sky. We see countless steam vents throughout the park; trek over old lava craters and around ancient Hawaiian petroglyphs, venture into a dimly lit lava tube, and marvel at verdant rain forests populated by birds whose indigenous songs can be heard only in this area. We are even treated to a rare encounter, up close and personal, with several cute little geese which are Hawaii’s national birds, the Nene. The route home from the Volcano Park beckons us to stop at the Punalu’u Black Sand Beach. Here, at the base of all that extraordinary black sand, statuesque palm trees do a gentle hula in the breeze. This enchanting beach is home to many turtles which frolic in the bay and then venture up on the rocky shore to sunbathe and enjoy the easy Hawaiian life they have come to know so well. 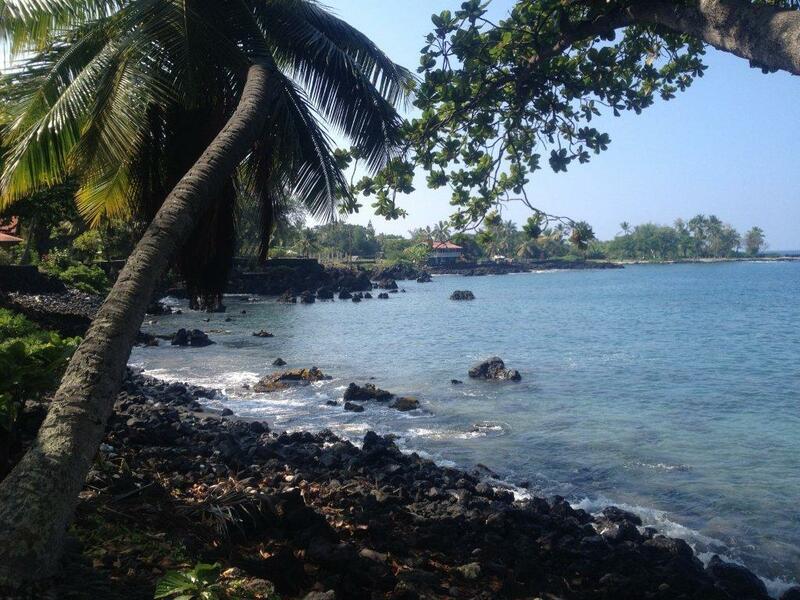 On we go over the winding coastal road, passing coffee and macadamia nut plantations galore, to the hopping town of Kona. 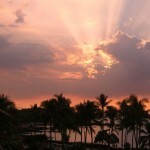 Kona town, also known as Kailua-Kona, is home to a lovely stretch of coastline, restaurants, island bars and shops filled with exquisite art and treasures made by local artists. This place is definitely worth a stop! If you are like me, you are always on the hunt for “the perfect beach.” Over the course of our time here we enjoyed so many different kinds of beaches – from the sweeping wide pristine white beaches of Hapuna and Mauna Kea (which I absolutely love), to one of my favorites, idyllic Mahai’ula Beach. I call Mahai’ula my “secret beach” because not too many people know about it, and once you arrive, you have the place all to yourself. To get there, you must bounce and bump over a couple of miles of virtually unpaved roads and rugged lava fields, and after parking, expect to make the rest of your way on foot. When you finally arrive at Mahai’ula, your reward is a breathtaking beautiful fringe of beach! Ringed by swaying palm trees, this stretch of alabaster sand and turquoise water is magnificent. We swim into the warm waters and dig our feet into the delightful sand. Under the shade of the plentiful trees, we picnic on fresh papaya, pineapple and sandwiches. When you visit here, don’t be surprised if you receive a visit from a herd of wild goats! After 10 days, we still have not seen all of the Big Island – a perfect reason to return very soon! With the spirit of aloha in my heart, I reluctantly turn my face back to the mainland, but a little piece of me stays behind on my favorite Hawaiian playground, the Big Island.